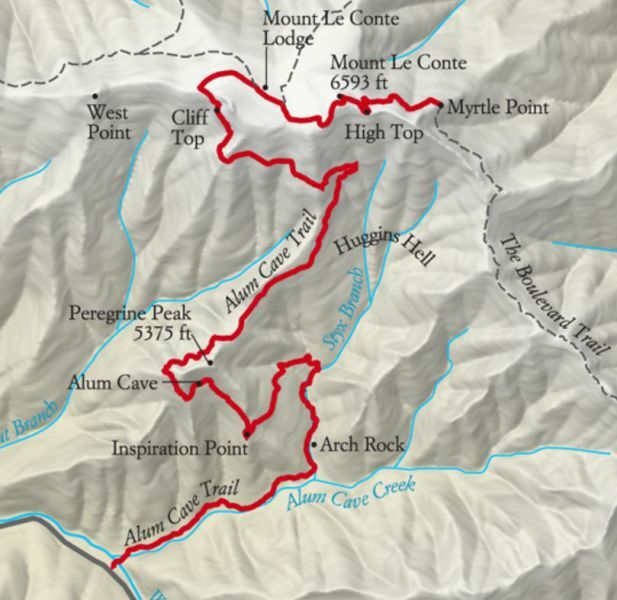 To reach the 6593-foot summit of Mount LeConte, you'll climb 2763 feet and hike 5.5 miles from the Alum Cave trailhead and return down the same route - very scenic views. The first section of trail, up to Arch Rock, is a fairly gentle climb. You'll follow the Alum Cave Creek for the first mile, before switching to the smaller Styx Branch just below Arch Rock. This section of trail is choked with rhododendron, offering beautiful blooms in early summer. At just over 1.3 miles from the trailhead you'll reach Arch Rock, the first prominent landmark along the trail. The arch was formed by freezing and thawing which eroded away the softer rock from underneath the harder rock. The trail actually goes under the arch and requires a climb of several steps etched into the rock to exit at the top. 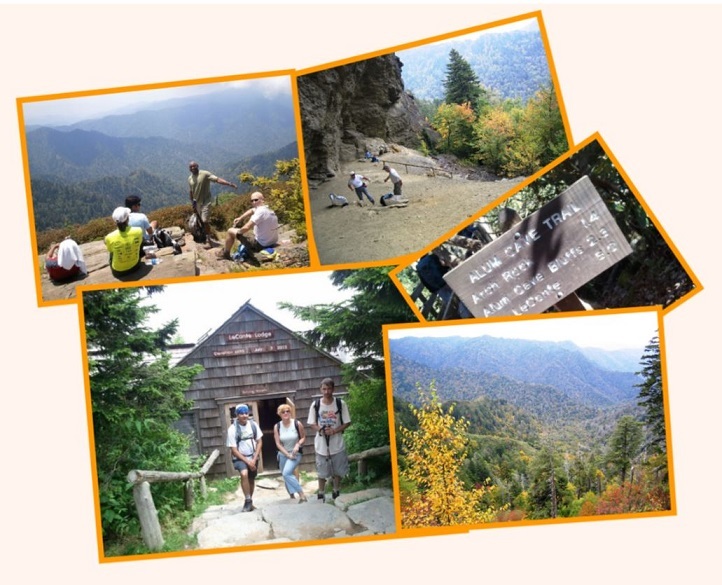 At roughly 2 miles into the hike you'll reach Inspiration Point with its commanding views of Little Duck Hawk Ridge to the west of you and Myrtle Point on Mount LeConte towards the northeast. The Eye of the Needle, a hole in the rock near the top of Little Duck Hawk Ridge, can also be seen from Inspiration Point. At 2.2 miles you'll reach Alum Cave, which, really isn't a cave, but is actually a concaved bluff, about 80 feet high and roughly 500 feet in length. During the warmer months of the year, water drips off the ledges above you. In the winter, these water droplets form into large icicles. During the Civil War, the Confederate Army mined saltpeter out of the cave in order to manufacture gunpowder. The views from Alum Cave are outstanding. Just past Alum Cave is Gracie's Pulpit. This landmark is named after Gracie McNichol, who, believe or not, hiked to Mount LeConte on her 92nd birthday. At roughly 2.6 miles from the trailhead, the pulpit marks the halfway point to Mt. LeConte. Over the next two miles you'll pass over several rock ledges, many with cable hand rails. A few of these ledges pass small waterfalls, requiring some negotiation to get around them while grasping on the cables. On a hot day, the cool water splashing on you is quite welcome. The last of these ledges passes right beneath Cliff Top. Once beyond this point the trail flattens out and you enter a spruce-fir forest. Before long, the LeConte Lodge cabins come into view. Before reaching the lodge, at just over 5 miles from the trailhead, the Alum Cave Trail dead-ends into the Rainbow Falls Trail. Before reaching the summit, the Trillium Gap Trail will branch off to your left at 5.2 miles. The summit, better known as High Top, will be at 5.5 miles. You'll know you've reached the highest point on Mt. LeConte when you've reached the cairn, or pile of rocks, just off the main trail on the right. At 6593 feet, Mount LeConte is the third highest peak in the Smokies. However, from its immediate base to its highest peak, Mt. LeConte is the tallest mountain in the Eastern United States, rising 5301 feet from its base near Gatlinburg. 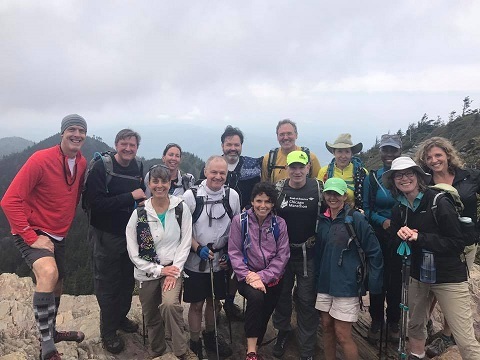 You won't have any views up at High Top; There are two places on the mountain where you can find outstanding panoramic views.. We will stop and have a snack or very light lunch and enjoy the views at the summit of LeConte. After our snack/lunch break, we will begin our hike back down via Alum Cave Trail and and re-group at the trail head. The hike down the mountain is just as scenic as the hike up the mountain! Time permitting and group attitude & appetite, we may stop nearby for dinner before continuing back to Atlanta. ***The above Itinerary, carpool arrangements & meeting logistics, and routes are subject to change at the discretion of the trip leader(s). ***This event requires participants to have recent D5 or equivalent hiking experience and subject to review, screening and approval by the trip leader(s). This is not a beginners hike. ***For those staying after the hike or planning on dinner afterwards, make sure you are in like-minded carpools. Weather on the mountain is normally cool and constantly changing, so please dress appropriately. - Trekking Poles or Hiking Stick are recommended. -Enthusiasm and sense of humor, and a strong pair of hiking legs! 1) Take I-85 North about 18 miles to Exit #113, I-985 North. (The Indian Trail Park/Ride Lot at Exit #101). 2) Bear Left at I-85 Exit #113 onto I-985/ GA-365 North and follow it beyond Gainesville where it merges with US-441 North. (Merge point is about 45 miles north of the I-85 exit, near Cornelia, GA). NOTE: In lieu of using the above simplified directions from NE Atlanta you can enter "Oconaluftee, NC 28719"as your destination and use Google.com/Maps for detailed directions from any point of origin. Carpool Cost: Estimated cost per vehicle for this event is $132.40 using a reimbursement rate guideline of $0.400 per mile. The total amount should be divided by the number of people in the vehicle, including the driver. This is a guideline, not a rule, for drivers but the cost should not be higher unless there are extenuating circumstances.